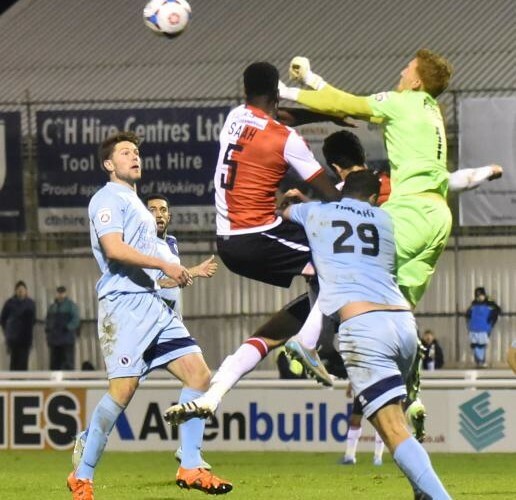 Woking rise to seventh after entertaining draw against Boreham Wood. Woking put on a good display, but could not get through visitors Boreham Wood as the result ended as it started. The point moves Woking up the National League table into seventh with a game in hand over Macclesfield who sit just above the Cards. Manager Gary Hill was optimistic and called this a “Fair result” and gave credit to the visitors who defended well throughout the match. He said, “I think they came here today and matched our play of 4-4-2 formation and there was very little between the two sides over the 90 minutes. After Woking’s victory on the weekend against local rivals Aldershot, Gary Hill made no changes to the side that won. The Cards set up with a traditional 4-4-2 as Woking looked to fill the midfield and counter on the break with the likes of Bruno Andrade and John Goddard, the star man for Woking this year, on the wings. It was a very uneventful opening 20 minutes, no real defining moments as both sides struggled to get into a rhythm of play that would suite them. Luke Garrard was forced to make an early substitution as Mauro Vilhete pulled his hamstring and it was Luke Howell to come on. The first real opportunity in the match came following the early change by Boreham Wood. Bournemouth Loanee, Joe Quigley received the ball from Andrade, striking a half volley into keeper James Russell. Boreham Wood proved to be a tough team to break down, boasting the 5th best defence in the league but it is the lack of goals that has been the biggest worry for Boreham Wood. An opportunity arose as Mustafa Tiryaki hammered home a powerful volley, unfortunate for him Jake Cole was even more aware, punching the strike over the bar. Just before the break Woking’s Dan Holman had a goal disallowed. Andrade sent an in-swinging free-kick into the box, met with precision by Holman but the referee and the linesman pulled the goal back for an offside infringement. Defensively on the night Boreham Wood were really impressive, Rickey Shakes deserved a lot of that praise after he denied Holman a clear opportunity. The Colchester Loanee striker skipped through the defence, just as he looked to have lined his shot up, Shakes came in to swoop the ball clear and out of danger. Hill made a few changes as players showed signs they were getting tired, expected following the derby clash three days ago against Aldershot. A late surge came from Woking with five minutes remaining on the clock, a cross from Jake Caprice was met by Giuseppe Sole, but his header was saved by Russell. The resulting corner saw Murtagh glance a header just past the post and the referee blew his whistle for full time. A draw was the fair result, but Woking will have to keep this momentum up as they host their local rivals Aldershot come Saturday.